Mac OS (Classic) Lion Entertainment, Inc. Final Doom is a set of two campaigns : The Plutonia Experiment and TNT: Evilution. 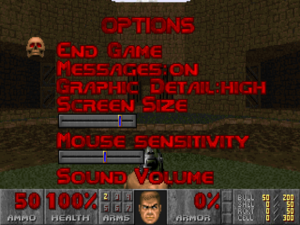 The Doom engine was made open source in 1997, making the game very mod-friendly. Includes an official Windows 95 engine for the game. Bundled with Doom II and Master Levels for Doom II. Pre-configured to run with DOSBox v0.74 (included in download). Uses the rare bug-fixed version of Final Doom included in the id Anthology collection. Pre-configured to run with DOSBox v0.72 (included in download). 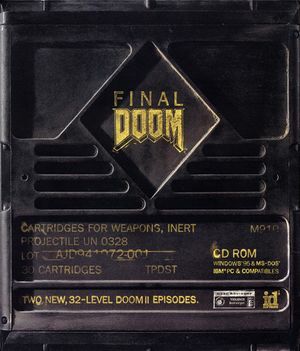 Some copies of the id Anthology version contain an updated Final Doom; the rest uses the original. The GOG.com release uses this alternate version. All patches for the retail versions of Final Doom (as well as Doom and Doom II: Hell on Earth) can be found here. Game forces vertical mouse movement (forward and backward movement via mouse). novert is a program that disables vertical mouse input. Download novert and extract novert.com in <path-to-game> alongside DOOM2.EXE. Edit plutonia.conf, plutoniam.conf, tnt.conf, and tntm.conf with a text editor, and in the [Autoexec] section, add novert.com before the line calling the game's executable. Save the changes in the *.conf files and close. Since the release of the engine's source code, various source ports have been released. See the link above for details and recommendations. Minor Sprite Fixing Project - Corrects sprite offsets and other graphical errors. Compatible with both original DOS release and source ports. Master Levels Menu Interface - An in-game menu that serves to replace the old DOS program that would launch a chosen WAD of the Master Level for Doom II expansion. This mod allows you to play them in one sitting without restarting the game or loading each individual WAD file. WadSmoosh - Combines all the official classic Doom IWADs (Doom, Doom II: Hell on Earth, Master Levels for Doom II, and Final Doom) the user can provide, as well as the No Rest for the Living WAD from Doom 3: BFG Edition, into a single PK3 IWAD with each game selectable as episodes. The bonus secret levels from the Xbox port of Doom 3 can also be integrated. Roland SC-55 music packs - Soundtrack for TNT Evilution recorded on an authentic SC-55, the midi player for which the soundtrack was mixed on. Choose either OGG or FLAC; MP3 does not support proper looping. For The Plutonia Experiment, download the Doom I and Doom II soundtracks from higher up on the page and run the linked Windows batch script. Widescreen Status Bar - Designed for compatible source ports that support widescreen resolutions. In addition to removing the brick patterns that appear on the side of the bar when upscaling it, it also helps prevent graphical glitches that sometimes occurs from the upscaling process. Some source ports may require adjusting the status bar upscaling size manually in their respective options menu to retain the intended aspect-ratio. Doom Remake 4 - This is an overhaul pack for Doom 1, 2 that is based on GZDoom source port. It brings 3D models, Hi-Res textures with PBR materials, new visual effects (sparks, smokes, explosions), hires decals and blood splatters. Supported by GZDoom. See Source ports. Toggle with Alt+↵ Enter in DOSBox or its source ports, if supported. Capped at 35 FPS; for 60+ FPS see Source ports. For ZDoom-based ports and Odamex: enter fov <1-179>. Modern branch: Run GZDoom in fullscreen at your display's native resolution. Vintage branch: Set Fullscreen to OFF and Borderless Windowed Mode to ON from the Video Mode options. Open the *.cfg file(s) where the Doom Retro folder is located with a text editor. Find the variables vid_scaleapi and set it to either direct3d or software inside the quotation marks, then find vid_screenresolution and set it to desktop. Save the file(s). Doom Retro now should run in borderless fullscreen windowed. Supported by ZDoom and its derivatives as well as Doom Retro. See Source ports. Limited to only remapping Fire, Use, Sprint, and Strafe in the DOS version. Some source ports feature broader controller remapping options. See Source ports. Some source ports have adjustable analog stick sensitivity settings. ZDoom and its derivatives also support XInput trigger sensitivity settings. See Source ports. ZDoom-based source ports and Doom Retro have XInput support. Use a ZDoom-based source port or Doom Retro. ZDoom and Doom Retro reference XInput controllers with Xbox notations. Supported by ZDoom and Doom Retro. See Source ports. Doom Retro features vibration for XInput controllers. ZDoom-based source ports and Doom Retro allows simultaneous inputs between controller or keyboard and mouse. Zandronum is recommended for online play as it adds modern networking support and simplifies the process of finding games. Provided by Zandronum and Odamex. See Source ports. Edit plutonia.conf, plutoniam.conf, tnt.conf, and tntm.conf with a text editor. Under the section [sdl], look for the line fulldouble=true and set it to false. Save and close all files. Apply a palette fix (see Rainbow color problems in older games). Right-click the DOOM95.exe file, click Properties, go to the Compatibility tab, then set it to Windows 95 compatibility mode and tick Run the program as administrator option. Go to %WINDIR%\SysWOW64, copy dplayx.dll and paste it into <path-to-game>, then rename the copied file to dplay.dll. Download the Doom95 XP Mouse Patch and extract it to <path-to-game> folder. Run the program and at the end of the page, click the install button. Use the Configure button to disable Vertical Axis to prevent moving forward with the mouse, smooth the mouse and add parameters if desired. Run DOOM95.exe, go to Advanced/Screen Resolution and set it to the highest resolution available. This bug has been patched in some releases of the id Anthology version of Final Doom; GOG.com carries the bug fixed version. The yellow keycard in MAP31: Pharaoh from TNT: Evilution is missing due to it being accidentally flagged as a multiplayer-only item, making it impossible to complete the level with 100% completion without resorting to cheats. Download the PWAD file here. Extract TNT31.WAD in the same folder as DOOM2.EXE. Use the -file TNT31.WAD command line parameter to load the fix. To automate this process on the Steam version of Final Doom, edit tnt.conf and tntm.conf with a text editor, and under the [Autoexec] section, find the line calling the executable and add TNT31.WAD after DOOM2.EXE -file TNT.WAD. 2.0, 3.3 Supported in GZDoom, Zandronum, and Doom Retro. See Source ports. ↑ 2.0 2.1 File/folder structure within this directory reflects the path(s) listed for Windows and/or Steam game data (use Wine regedit to access Windows registry paths). Games with Steam Cloud support may store data in ~/.steam/steam/userdata/<user-id>/2290/ in addition to or instead of this directory. The app ID (2290) may differ in some cases. Treat backslashes as forward slashes. See the glossary page for details. "(modern branch only) Fullscreen is now borderless window (which, technically, it always has been, anyhow). Removed hacks which changed the desktop resolution in order to simulate exclusive fullscreen because they were a constant stability concern." Have tested using Windows 95 compatibility on the game's executable when using DOSBox, which did not stop the freezing issue until disabling double-buffering within DOSBox under Windows 7 and 8.1. This page was last edited on 28 March 2019, at 00:06.